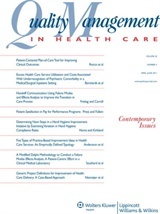 In its July 2010 issue, QMHC 19:3, Quality Management in Health Care published an article entitled, “Using In Situ Simulation to Identify and Resolve Latent Environmental Threats to Patient Safety: Case Study Involving a Labor and Delivery Ward” submitted by William Hamman, MD, PhD; Beth M. Beaudin-Seiler, MPA; Jeffrey M. Beaubien, PhD; Amy M. Gulickson, MDiv;, Krystyna Orizondo-Korotko, MS; Amy C. Cross;, MS; Wayne Fuqua, PhD; and Richard Lammers, MD. The theme, simulation as a research tool, was innovative and interesting. The professional credentials and academic afﬁliations listed by the authors were sterling. Peer review had uncovered no potentially serious issues. Then, in mid-December 2010, it was publicly revealed that William Hamman, the corresponding author, is not a physician and does not hold the PhD degree he claimed. For over 15 years he had been falsely representing his academic qualiﬁcations to granting agencies, health care organizations, and publications. QMHC, like the other journals that have published work bearing Hamman’s name, had to issue an apology to its readers for an inadvertent deception or retract the article. Retraction is a serious sanction to impose on a team of coauthors. In the present case, the other authors’ credentials are perfectly legitimate. Mr. Hamman had not been involved with data collection or processing. On its own, the article was acceptable. His coauthors were unaware of his deceptions. However, further investigation showed that Hamman and the same team of coauthors had published closely similar but not identical papers in other journals. The combination of these ﬁndings means that QMHC has no choice other than to issue a retraction of our article. The original publication of this article incorrectly cited fourth author, William Hamman, as holding MD and PhD credentials. In December 2010, it was brought to the publisher’s attention that Mr. Hamman does not hold either credential.